[ABOVE] Bombay Aloo, an Indian vegetarian restaurant which today occupies the site of the business premises of Willett Brothers, carvers & gilders, 39 Ship Street, Brighton (2009). The firm of Willett Brothers occupied the building at 39 Ship Street from around 1858 until about 1876. 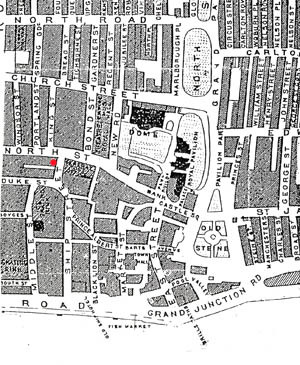 [ABOVE] A Victorian map of Brighton showing the location of the business premises of Willett Brothers, carvers & gilders and photographers, at 39 Ship Street, Brighton. [The site of Willett Brothers' shop is marked with a red dot ]. The Willett Brothers - George, Henry and Robert Willett - were originally from central London. Miss Frances Willett (born c1819, London) and her brothers George Willett (born c1821, London), Henry Willett (born c1824, London) and Robert Willett (born c1827, London) settled in Brighton around 1858. The Willett Brothers - George, Henry and Robert Willett - had established a picture-frame making business at 39 Ship Street, Brighton before 1859. The Willett Brothers are listed as "Carvers & Gilders" at 39 Ship Street, Brighton in a Sussex Trade Directory published in 1859. 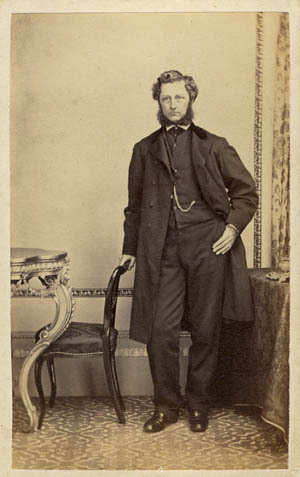 In the early or mid 1860s, the Willett Brothers set up a photographic portrait studio in their business premises at 39 Ship Street. 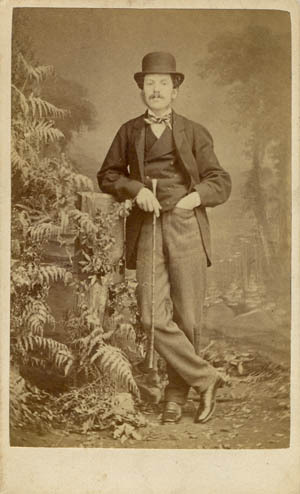 It appears that Henry Willett (1824-1896) was the main photographer for the firm of Willett Brothers and for a brief period he produced carte-de-visite portraits under his own name. The Willett Brothers were mainly engaged in the business of picture-frame making, carving, gilding and other decorative crafts. 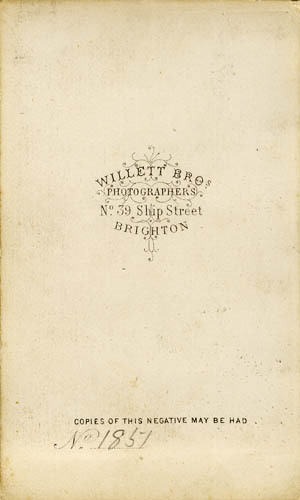 The only time the firm of Willett Brothers were listed as professional photographers was in the Postal & Commercial Directory of Brighton, published in 1867. 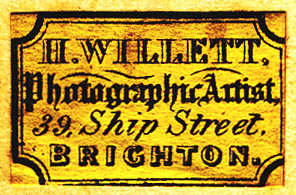 The Willett Brothers studio was taking photographic portraits at 39 Ship Street, Brighton until the mid 1870s. George Willett and Robert Willett eventually left Brighton, leaving the carving & gilding business at 39 Ship Street in the hands of Henry ("Harry") Willett senior and his son Henry Willett junior (born 1853, Walton, Leicestershire). From the late 1870s the firm was known as Henry Willett & Son, Practical Gilders, Frame Makers & Picture Restorers at 39 Ship Street, Brighton. 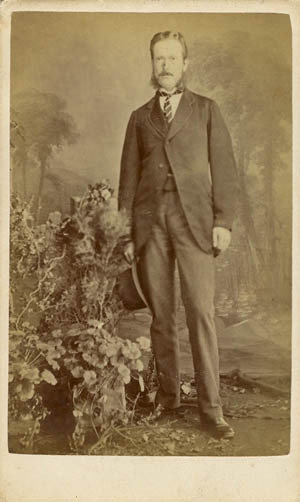 Henry Willett's second son, Arthur Willett (1857-1918), became a professional artist and exhibited watercolours in several London art galleries, including exhibitions at the Royal Academy, between 1883 and 1906. 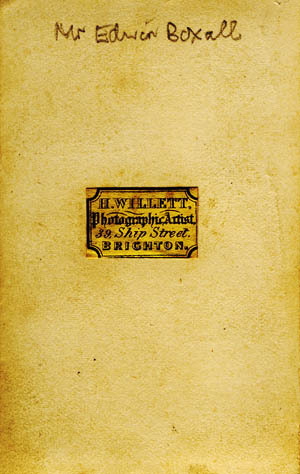 [ABOVE] The trade plate of Henry Willett, Photographic Artist, 39 Ship Street, Brighton (c1862). 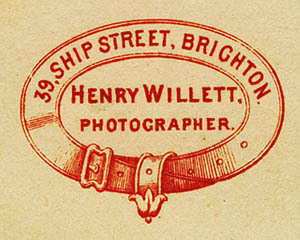 [ABOVE] The trade plate of Henry Willett, Photographer, 39 Ship Street, Brighton (c1865). 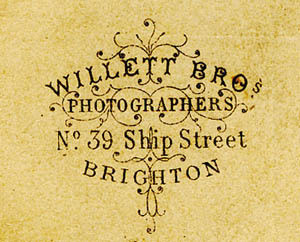 [ABOVE] The trade plate of Willett Brothers, Photographers, No.39 Ship Street, Brighton (c1867). 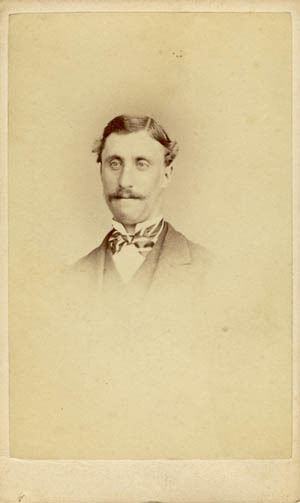 [ABOVE] A carte-de-visite portrait of Brighton solicitor Edwin Boxall (c1826-1907), taken at Henry Willett's photographic studio at 39 Ship Street, Brighton (c1864). 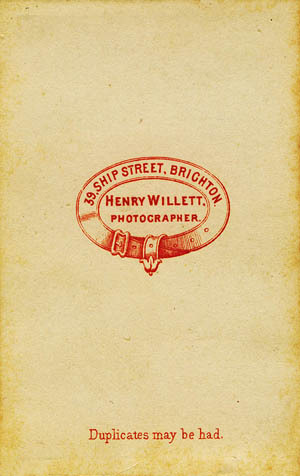 [ABOVE] The reverse of a carte-de-visite portrait showing the trade plate label of Henry Willett, Photographic Artist, 39 Ship Street, Brighton (c1864). 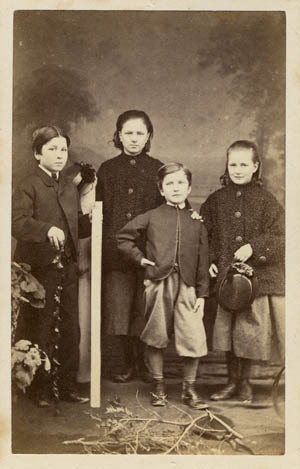 [ABOVE] A carte-de-visite portrait of a group of children, photographed by Henry Willett' at his studio at 39 Ship Street, Brighton (c1865). 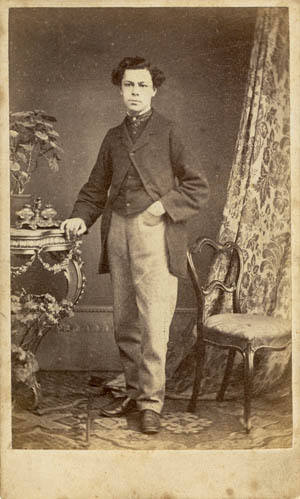 [ABOVE] The reverse of a carte-de-visite portrait showing the trade plate of Henry Willett, Photographer, 39 Ship Street, Brighton (c1865).